The pungent, fresh smell of handmade soap is the first thing to hit me as I walk into the darkened shop. Lavender and sandalwood and something citrus-y. As my eyes adjust from the bright New Mexican sun outside to the dim interior of the tiny gallery, other smells meet my nose, too – incense and oil paint and something that smells much, much older. Underlying the scents of canvas and soap lies the smell of history – the smell of mud bricks and white wash. The smell of life in a traditional adobe pueblo. But we don't learn about much of the Native American history of our state beyond the fourth grade (which is really too bad). So when I learn that there's an ancient pueblo not far from where I'm visiting a friend in Santa Fe, New Mexico, I decide I have to go. The pre-colonization history of America is fascinating to me, but I'll admit that I haven't done my due diligence as I've gotten older; I don't seek out this history nearly enough. But I vow to do it at Taos Pueblo. 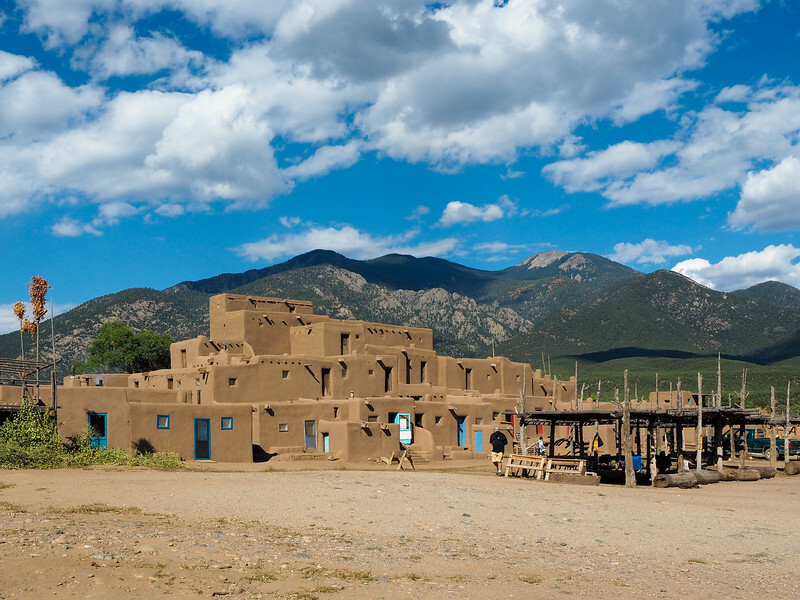 Taos Pueblo is located near Taos, New Mexico, about a 1.5-hour drive from Santa Fe. 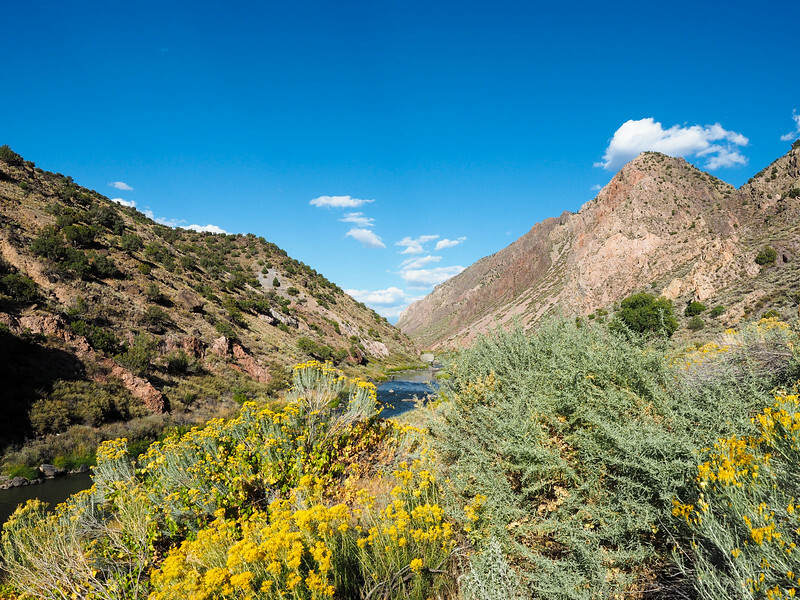 I make the drive on a sunny afternoon, admiring the mountainous scenery along the Rio Grande and imagining what I'll find in Taos. If you know anything about Native American history in the United States, you'll know that settlers in pre-America weren't particularly kind to the people they found living on the land when they arrived. They killed them (with weapons and disease), and drove most of them off their land. Today, the reservations that remain are home to some of the poorest people living within U.S. borders. Taos Pueblo is a little different, though. 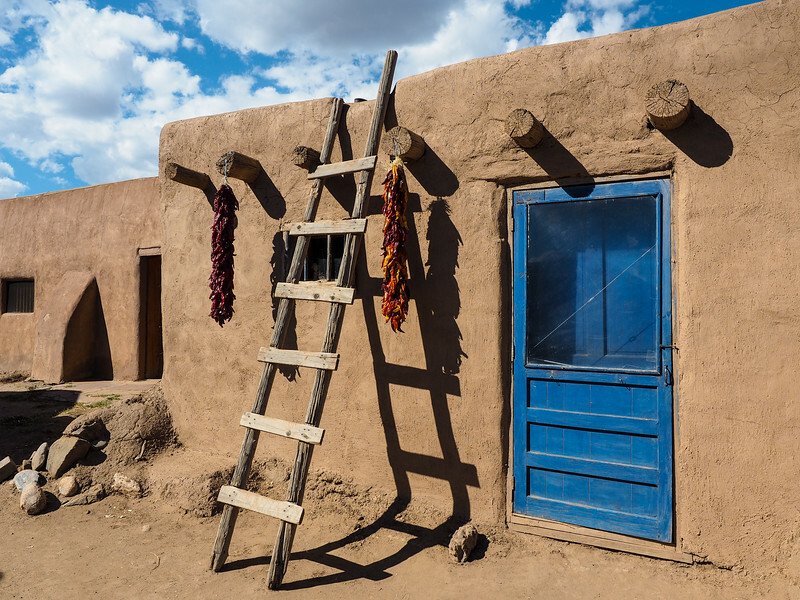 The pueblo is an ancient one – people from the Tiwa-speaking tribe have lived in this area for at least 1,000 years, making this pueblo one of the oldest communities in the United States. This is one reason that Taos Pueblo is both a National Historic Landmark and a UNESCO World Heritage site. But those designations denote more than just age. When I first get to Taos Pueblo, I feel completely out of place. I get my visitor's ticket and make my way into the walled pueblo with a handful of sunhat-wearing tourists toting cameras and pueblo maps. I know that Taos Peublo IS a tourist attraction – but it's also still a living community. 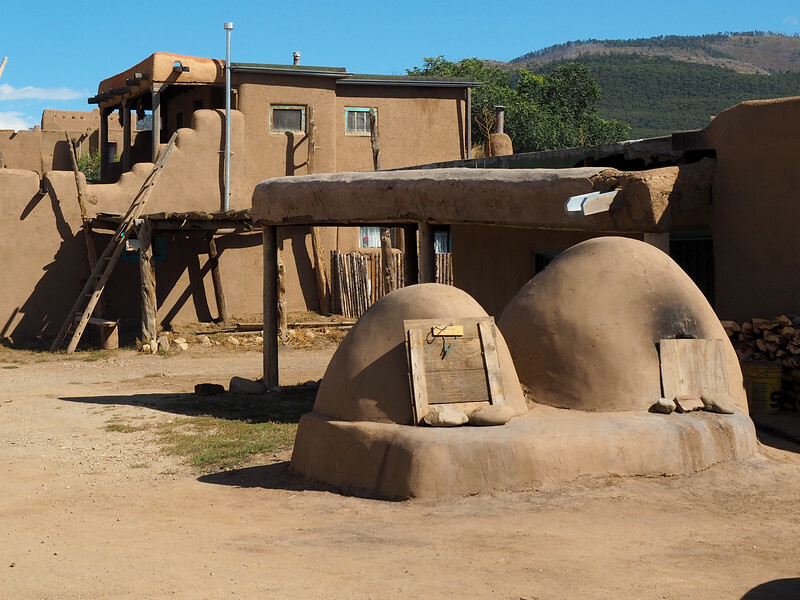 Even though Taos Pueblo dates back for centuries (in fact, the main part of the current adobe buildings were built prior to 1400), it's not just a historical monument or museum. Taos Pueblo is living history. This isn't immediately obvious while walking around inside the pueblo, though – you have to look a bit for it. There are small hints. Some red chilis hanging outside a doorway to dry. The blackened openings of the mound-like earth ovens that suggest recent use. And, of course, the little art galleries and jewelry shops set inside traditional adobe homes where you can buy pottery and paintings and beautiful silver bangles. These days, very few people still live within the pueblo walls, owing to the fact that the governing Tribal Council does not allow modern amenities like electricity and running water. Most of the community, therefore, lives in modern houses outside the pueblo walls. Inside those walls, though, history and tradition lives on. Bread is still baked in the humped earthen ovens. Trained hands still spin traditional pottery. And, once a year, the community still holds a ceremony to refinish the walls of each building in the pueblo with a new coat of adobe plaster. As I walk around the pueblo under the hot New Mexican sun, I try to imagine living here today. A few families actually still do, calling the small two-room adobe houses home permanently. I know it would be a struggle. But they obviously feel some sort of ancestral pull (and maybe even obligation) to this place. I decide to join a guided walking tour of the pueblo to hopefully learn why. We start at the San Geronimo Chapel, which dates back to 1850. 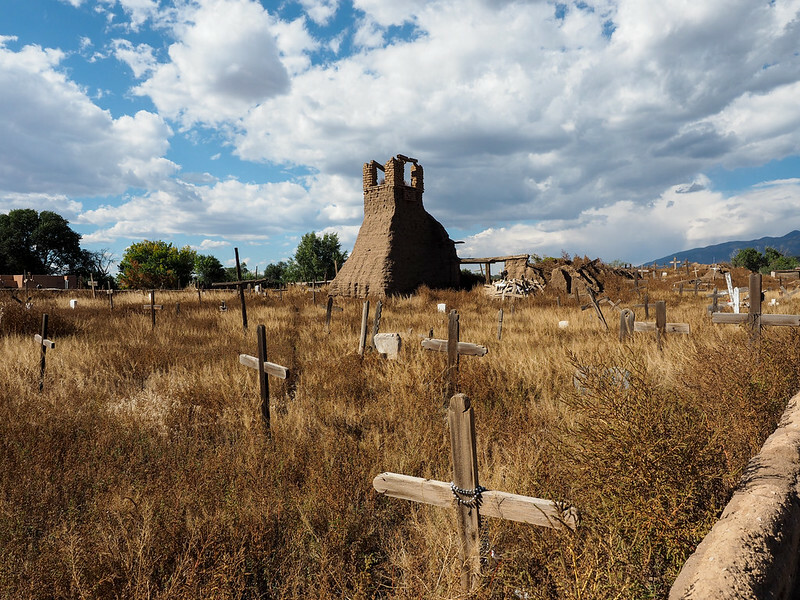 It replaced another church on the same spot that was built by Spanish colonists but was destroyed by the U.S. Army in 1847 at the end of the Mexican-American War, when the native Taos people joined with Mexican forces to rebel against the territory of New Mexico becoming part of the United States. As our guide tells the story of the destruction of the church (with plenty of people inside of it taking sanctuary), I realize that Taos Pueblo has seen its fair share of violence and conflict over the years. We walk over to Hlauuma or the Northern House next, which is the one of the largest Pueblo structures still standing anywhere in America. It's adobe walls rise four stories, and our guide tells us that they are several feet thick, thanks to the tradition of adding a new layer of plaster to the outside each year. Here at Taos Pueblo, this structure (along with the Southern House across the river) is sacred to the community. And you don't take sacred lightly here. We stand in the shade within view of the Northern House while our guide, a young college student who grew up in the Taos Pueblo community, tells us one of the most interesting stories related to the pueblo's history. Back in the early 1900s, President Teddy Roosevelt decided to take tens of thousands of acres away from the pueblo's land in order to create the Carson National Forest. Now, while I am a big fan of national parks and protected lands in the United States, this land was already being protected by the tribe. Part of the land in the mountains set aside for the National Forest included Blue Lake, which the Taos Pueblo people consider sacred. 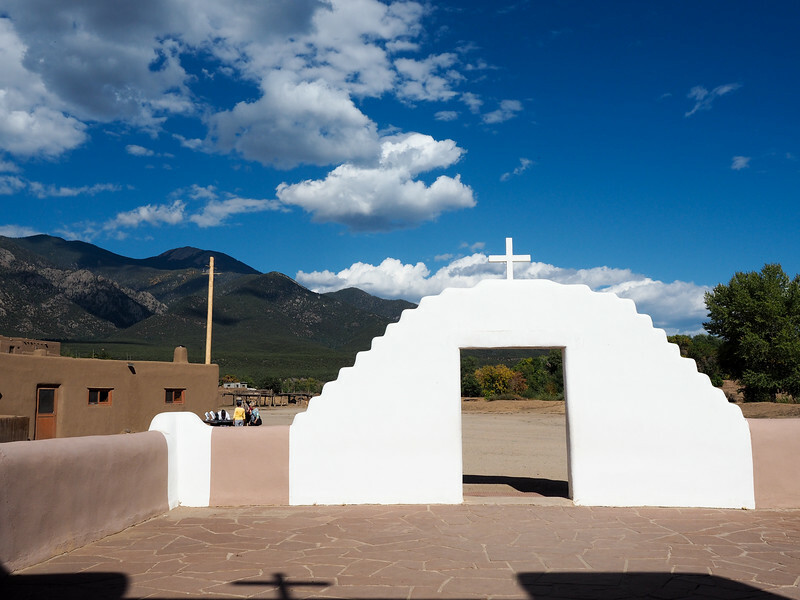 Even though many of them were converted to Catholicism by the Spanish settlers who came in the 1500s, the tribe still holds the spiritual belief that the Taos people originated from the lake. Losing it was essentially losing a huge part of their history; part of their identity. The story makes me uncomfortable – but it's a common one when it comes to land traditionally belonging to the native people in America. Thankfully, this story has an unexpected ending. While most land taken from Native Americans by the government has stayed in government hands (or been sold off to other people), the people of Taos Pueblo won a huge victory in the 1970s when Blue Lake and most of their former land in the mountains was given back to them. Today, the lake is off-limits to anyone except members of the pueblo. After the tour ends, I wander over to a wooden bench beside the small river that runs through the center of the pueblo. The sun is hot – almost unbearably so – but a cool breeze flutters the leaves in the shade. I look out over the pueblo, and realize that I think I get it. I can never fully understand or relate, of course, since this isn't my culture or history. But I think I understand why people have decided to stay here – even live here. 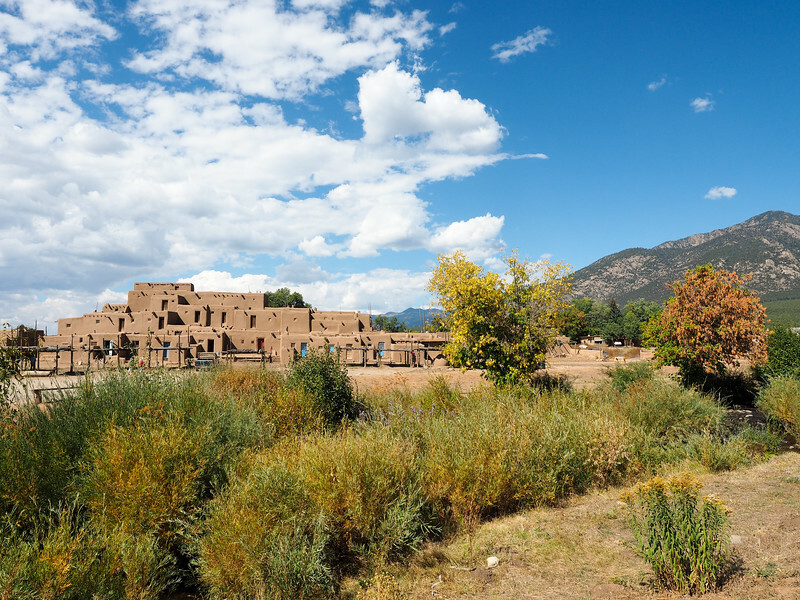 To the people of Taos Pueblo, this isn't just another historic site for tourists to visit. It's their history and culture embodied; their story; their home. If you ever find yourself in northern New Mexico, I highly recommend a visit to Taos Pueblo for this glimpse into a history and way of life many Americans know very little about. WHERE: Taos Pueblo is just outside of the city of Taos in north-central New Mexico. WHEN: Monday – Saturday from 8 a.m. to 4:30 p.m., and Sunday from 8:30 a.m. to 4:30 p.m. Some areas of the pueblo are closed off, and you're asked to respect the “restricted area” signs. Also be sure to respect the local culture and traditions – no photos of tribe members without permission, and don't wander into the local cemetery. You're also asked to take care around the river, as it acts as the pueblo's source of drinking water – don't go (or throw anything) in! Lastly, bring cash if you're interested in purchasing any art or jewelry. Some galleries and shops will take credit cards, but others won't. 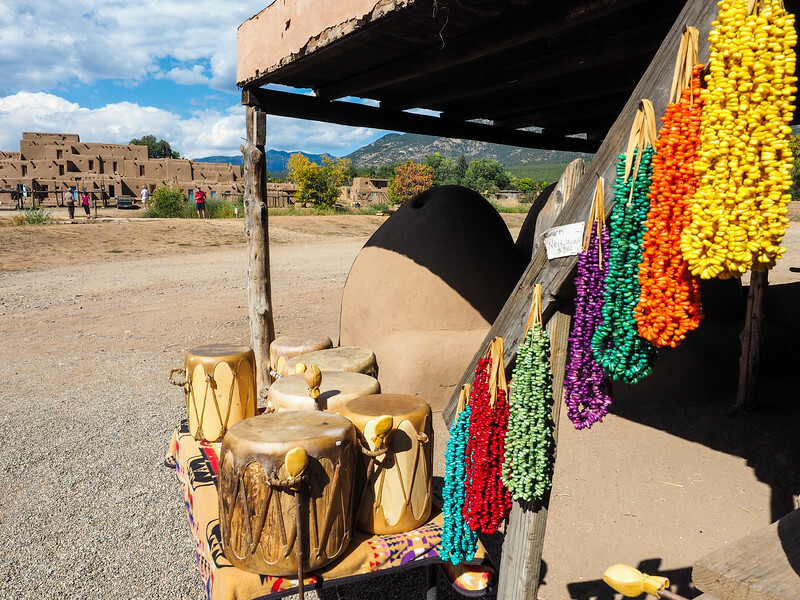 Have you ever been anywhere like Taos Pueblo? One of my favorite movies – if I’m not mistaken – was partially filmed in Taos: Easy Rider. So it’s a place that interests me. I’ve never visited a place like Taos but it’s a fascinating place to learn about history. It really is fascinating! I don’t usually associate truly “old” history with the US since it’s such a young country, but the history here goes back a long time! Wow! Never knew such a place existed. Thanks for writing about it and letting the world know! Wow, we have never thought of visiting New Mexico before, but reading your article about the White Sands National Monument and now this one make us put it on the list! 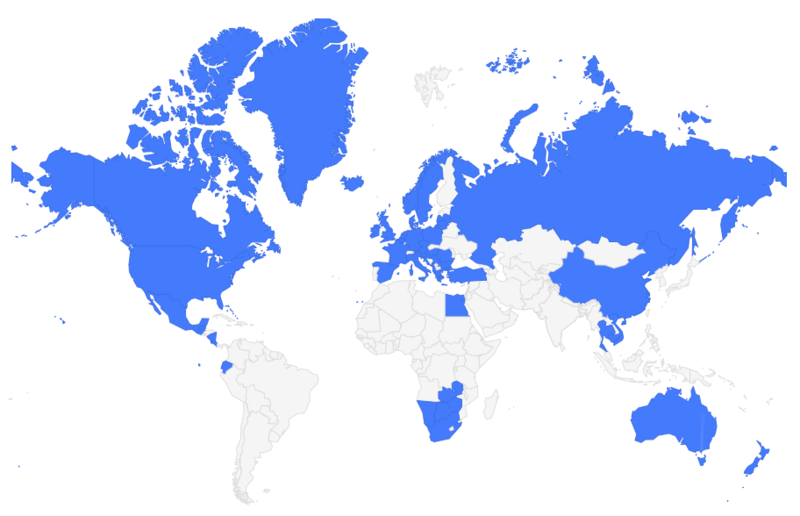 It never ceases to amaze us how big and varied the US is though it’s just 1 country in the world (but a really big one, to be fair :D). I know! Nearly every state could be its own country with its own unique culture and history. New Mexico is on of my favorite states in the US! Taos certainly looks like a great place to learn about history. And it’s also wonderful that the people living in the area were fortunate enough to have their land given back to them. Also, great tips at the end of the blog post. SO true. I love the Southwest for that very reason – it’s such a different world! I love the Native American national parks and monuments. I haven’t been here – and I was surprised to learn that people still live at the site – but my favorite sites are Navajo National Monument and Canyon de Chelly, both in northeast Arizona. Taos Pueblo was so interesting because it’s quite different from the other Native American sites and parks I’ve visited (like Monument Valley and Antelope Canyon). It’s more of a living history site as opposed to just pretty landscapes. I’ve never heard of it, but it looks gorgeous! It always makes me feel a bit uncomfortable when I know a sight is actually someone’s house or living area. I had this same feeling when tourists were traipsing around Uluru like they owned the place. That having been said, the landscape looks gorgeous and the area looks truly special! Yeah, I know what you mean. There were a lot of “restricted” signs around the pueblo, which was a reminder that people still live there. But, at the same time, I know that tourism has become an important source of income for the community. So it’s one of those tricky lines to walk. I’m really glad I went, though – I learned a lot that I never would have known if I hadn’t gone! I’ve wanted to visit the Taos Pueblo for awhile! New Mexico often gets a bad rap, but it’s such an underrated state with one of the richest Native American histories in the country. I totally agree! New Mexico is definitely underrated. I came across this blog when I searched “Tieks arch support” because as a fellow traveler, I’ve been debating getting Tieks flats for the longest time. Anyways, in a blog you write about these new cognac colored Tieks you got you shared a review and then said something like “ask me in a year if they held up” — so this is me asking: did they? Thank you so much for your reply! Hey Sophia! Sorry about that – the comment may have been flagged since it doesn’t really relate to the content of this specific post. As for your question, I still have my Tieks! However, I don’t wear them ALL the time, so my use case is a little different than someone who lives in flats. They’ve held up well, though, for how often I’ve worn them! Wow that’s pretty neat. It’s awesome that they were able to retain this area for future generations. It’s unreal how diverse our cultures are in America. I’ll add this to my list next time I’m in New Mexico again. My last trip was too short – this time i’ll stay longer for sure. Definitely spend longer in New Mexico next time – it’s a pretty interesting state! 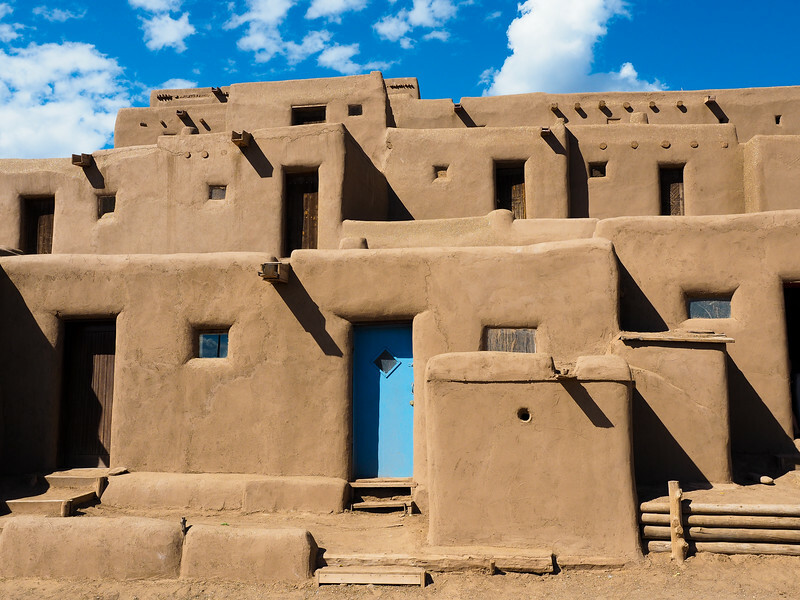 New Mexico has such an interesting mix of history – everything from Native American to Mexican to Spanish influences! Love the intro Amanda, I could smell it all with you! And that last photo is profound, love it. It’s really great that, though places like this (even though this pueblo is different) get swarmed with tourists one can still have a wander around and see that life is actually still going on with old traditions as well. Great post, and when I get back to New Mexico I’ll try to check it out! I’m glad you liked it, Ryan! Toas in general is definitely worth visiting if you find yourself in New Mexico, and the pueblo doubly so! 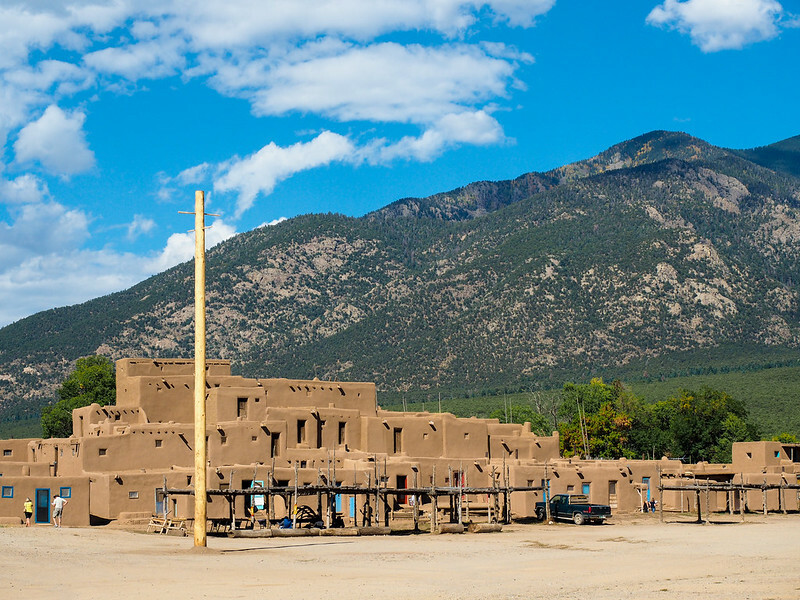 I haven’t spent much time in New Mexico, but it’s one of the first places I plan to hit up next year on my “6 month road trip” – I’ve bookmarked Taos Pueblo, so thanks for that! What’s really interesting, is where the US Government got involved in inter-tribal issues, and according to the Hopi, the US took a bunch of land from them and reallocated to the Navajo. This history fascinates me and I’ve barely scratched the surface of learning – even just the # of tribes in the SouthWest alone, never mind the MidWest, NorthWest, NorthEast, etc…. The number of native tribes in the US is pretty incredible – I really need to spend more time learning about them, too! This is so cool! Adding it to my list of “must-sees” for US travel! Awesome! New Mexico has quite a few interesting native sites like this, but so far Taos is probably my favorite. Are there any shops offering workshops how to cooking traditional acorn bread? Or even offering this bread for sale? Hmmm, you know I don’t know! I don’t think they do any cooking demonstrations (though you can peek inside an earthen oven if you take the tour and ask your guide). And I didn’t *see* any food for sale, but I also wasn’t looking for it! The tribe I stay with had a similar event occur where they lost land (for gold) and the government basically blew up a mountain to find that gold. This was a sacred mountain where they did religious ceremonies, etc. The people are still devastated and that happened more than 30 years ago. Not only that, because of the blast, chemicals, and equipment, their water has cyanide in it now :(. They drink water that has cyanide in it. It’s awful. I’ve never even heard of Taos Pueblo and I’ve been all over Santa Fe. Again, I’m going to have to revisit! If you’ve never been, you should head to Mesa Verde and/or the Gila Cliff Dwellings. Based on what I’m reading here, you would love both of those places! I just wanted to know if there is a sign or monument telling about Blue Lake in Taos Pueblo and where it is located. You know, I didn’t see any there – but I also didn’t look. I went on one of the free walking tours led at the pueblo, and that’s where I learned the story of Blue Lake. You can always ask when you buy your entrance ticket!